BadMrFrosty wrote: They had a note within the package that said they are trying to reach forums by offering incentives of somekind. Now with that said I don't want be in the wrong by posting this or make it sound like I work for them and also not trying to step on Elites' toes. I'm just showing my interest in seeing what could become of this if the forum was offered something. I would send a PM to JMZ5, see what he says about it. Stitches1974 wrote: J&G have earned my business. I worded out a polite inquiry about my high shipping charge and just got this email back. Good deal and that is stand up of them. I received notification that mine has shipped. I believe the $730 plus $25 shipping is the cheapest I have ever bought. Cheef wrote: Good deal and that is stand up of them. Yep. Never thought I would see the day where SS197 would rival AE in price. WITH shipping the $755 for 2000 rounds works out to $18.87 per 50 round box. I'm pretty content right now considering local prices. 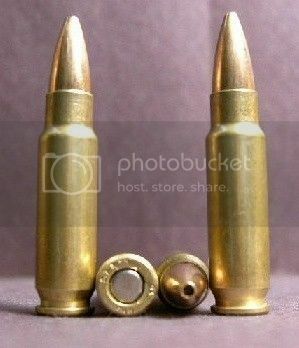 Cheef wrote: WITH shipping the $755 for 2000 rounds works out to $18.87 per 50 round box. I stand corrected. That's cheaper than AE anywhere I've seen. Looks like J&G is OOS on SS197. We cleaned him out. Stitches1974 wrote: Looks like J&G is OOS on SS197. We cleaned him out. Well there will be some 'splainin to do when my wife signs for it Friday morning. But just couldn't let it go at that price. :lmao: I went to go buy some more, but was disappointed. I'll be keeping an eye out on their website in the future. Refund was issued today. Will deal with again. I've bought tons of stuff off Palmetto State Armory. They are a great company to deal with. Got my custom Kyle Lamb VTAC MP-15 from them ( the first one ( & better IMOHO ), with the JP Enterprises single stage match trigger & speed hammer. - http://www.outdoorhub.com/reviews/2014/ ... ear-later/" onclick="window.open(this.href);return false; - I'm looking into getting that Century C39 Micro - after I see what Buffman thinks. This whole thing about the BATFS taking our M855 is wrong ( or not letting us get it or produce it is ludicrous ) - The Sig Brace just got its clearance letter from the BATFE , so I can have basically a SBR AK with a custom violin case off gunbroker that holds the C39 ( or any of your rifles, or rifle - pistols ) plus a lot of magazines. Not trying to hijack the thread, I'll repost. What does anyone ( who has shot the Century C39 MICRO think compared to the Draco or any other AK pistol that has a MILLED receiver. Please don't respond if you're going to compare it to anything stamped. I'm scooping up ammo off Gunbot for 41 cents for M855 a case, & already ordered 10 boxes of SS197 for $18.99 as well. Make sure and use a promo code for free shipping or a 10% discount on orders over certain amounts. They are a HUGE distributor & can come down more on their prices. Their upper & lower packages are really well priced, and they assemble it prior to shipping unless you ask them not to, and they do everything correctly. My buddy just got the PSA CHF complete rifle build Kit for $499 and it comes with a 26" 7075 FN T6 A3 ( machine gun steel as FN calls it and uses it in the M240 & M249 weapon systems. Comes in the 1 in 7" twist for up to 77 grain rounds ( same as the VTAC ), it's got a single stage trigger , everything else is obviously mil spec, but for the price, you can't go wrong. And yes of course my VTAC is a completely different animal than the PSA, but I'm just making a point that Palmetto State Armory is great for pretty much everything. On your next orders, include a note which directs them to this forum. Maybe they'd like to be a sponsor? Rapier1772 wrote: On your next orders, include a note which directs them to this forum. Maybe they'd like to be a sponsor? I emailed a response to them about this topic and they said they dont nessessarily have an incentive program. They did mention maybe emailing a code with a 10% discount. I had the email saved but my phone deletes read emails after a couple weeks. Like Rapier said try directing them here. I did mention this site in my email. I recently purchased some 5.7x28 ammo which supposedly is made with IMI 52gr. Match BT-HP and IMI 52gr. Nickel Match BT-HP projectiles with new FN brass. Anyone ever here about IMI making 5.7x28 projectiles? I buy a lot of their 5.56 ammo and really like it. I have not yet been to the range with it. 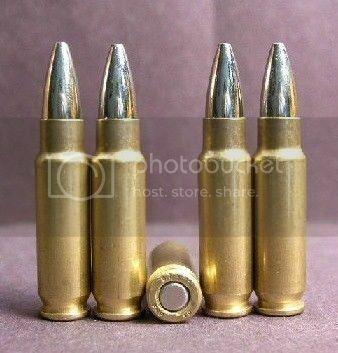 ewetstone wrote: I recently purchased some 5.7x28 ammo which supposedly is made with IMI 52gr. Match BT-HP and IMI 52gr. Nickel Match BT-HP projectiles with new FN brass. IMI does not produce 5.7x28 mm ammo. They only make 5.56.. What you bought was rounds put together by someone from pulled bullets or from a company that did it called duece45..
Yup....from duece45. I will have to ask them whats up with the "IMI" claim. They have excellent feedback on Gunbroker. Is there anything particularly wrong with their ammo? I didn't buy much...50 rounds. I have been looking for their rounds for my display but I didn't want to pay the prices on Gunbroker. I sent them an email many times and they never responded to any of my inquires as to when they would have any in stock. Also for the last few months their web site has been no longer up and running. Maybe Buffman or someone else will chime in as to if they have fired them. grimmond wrote: I have been looking for their rounds for my display but I didn't want to pay the prices on Gunbroker. I sent them an email many times and they never responded to any of my inquires as to when they would have any in stock. Also for the last few months their web site has been no longer up and running. Maybe Buffman or someone else will chime in as to if they have fired them. Yes...fairly pricey on Gunbroker but I was curious about the ammo and how the 52gr. round would perform. I also liked the shiny nickel jacketed bullets. At least I think they are jacketed...doubt they would be machined from solid nickel.